How Much is Actually “a Ton of Garbage”? Garbage costs money. However only very few people actually know how much it costs and what a ton looks like. Very few of us think further then to the curb. Let’s look at school garbage a little closer. 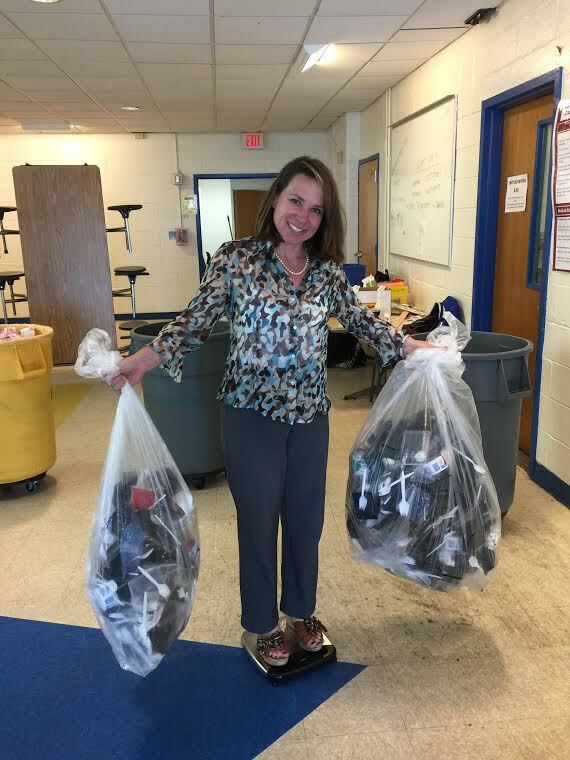 A school with 830 students generated 23 large black bags of garbage every lunch, the total weight of those bags is 398.5 lbs. This is what 23 bags look like. Now that we know what about 400 lbs of garbage looks like, lets think about it. A ton of garbage costs the tax payer around $80.00 to just dump it onto the tipping floor of the Incinerator, the big trash burning facility up in Peekskill. 400 lbs is a fifth of a ton. So, imagine 5 times the amount you see, or 115 bags of trash. Clearly the $80 per ton does not represent the only cost of garbage. This material has to be put in bags, then brought outside into the dumpster, then loaded by workers into diesel fuel guzzling trucks (about 2.5 miles per gallon of diesel), driven to a transfer station, dumped there, then loaded onto large trucks and driven 50 miles up north to be dumped onto the tipping floor of the incinerator. And then it is burnt into our air. I get dizzy just looking at how often this material needs to be touched and handled for it “to go away”. It takes that much time and effort to “just throw something away”. 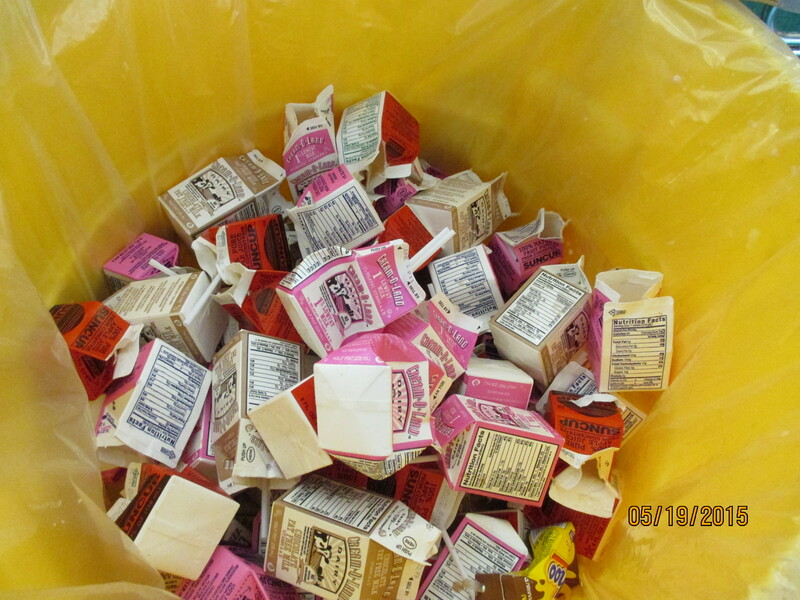 We just started the School lunch recycling program in this school and the kids sorted their lunchwaste into liquids, commingled, milk cartons, compost and trash. The results were astounding. 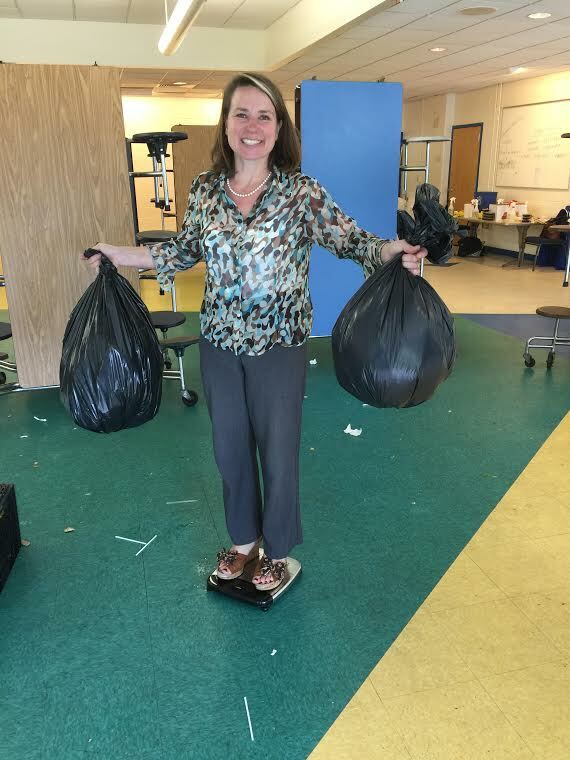 Out of the previous 398.5 lbs, only 8 lbs were actually non recyclable. That means that 98% of the material is recyclable. So, “just throwing it away” is not just costing us a lot of money, but in fact, we use tax payer money to burn materials that we could easily sell for a profit. This is what 10 lbs of commingled looks like. Some math on the value of commingled. 1 ton of plastic PETE 1 sells from the Yonkers MRF for around $800. (the cost is market driven, oil dependent and is fluctuating). 10 lbs of plastic (to simplify this calculation, it is all the same resin) 2000 lbs of plastics sell for $800.00 10 lbs = $4.00 Milk cartons sell for $450 per ton. 30 lbs = $6.75 And this is what 15 lbs of milk cartons look like, we had two of these bags. And two full 5 gallon buckets with waste liquid weighing 74 lbs. That means we use fossil fuels to truck liquids 50 miles north just to burn them, rather then sending them down the drain? By far the heaviest was the food waste. 180 lbs of wasted food from 800 kids, plus about 50 lbs of untouched never opened food that was placed into the share basket. Clearly, a ton of garbage is a lot, but as you can see, only 2% of it is actually non recyclable. So, our convenience to “just throw it away” costs us all dearly. Not just as hard cash but also at great environmental expense.